Collage created for publisher who is including me in a coffee table book about weird tattoos called INKED: Clever, Odd and Outragous Tattoos. Woo! They might use this one or one of the awesome ones Chris took. Ever since I was little I joked about getting my birthmarks numbered--that I was one big connect-the-dots tattoo that made a "me". When I got older I obsessed over the idea of an extremely visible invisible tattoo. I then worked for four years on a project I called "The Stalking and Murdering of a Childhood Giraffe" (EXPLAINED HERE) were I spent four years searching for a giraffe I had as a child and taking pictures of any I came across that were "rejects". 1,712 rejected giraffe photographs later, after I finally found the giraffe (with the help of over 50 friends or "giraffe hunters") I got this tattoo. Dave C. Wallin who made it did an AMAZING job considering how small the numbers had to be. Pretty sure I'm not the first person in the universe to come up with this idea, but I've yet to see another connect-the-dots tattoo. Got my tattoo on August 25, 2007. The design was based on a really geometric giraffe drawing I once saw (if anyone can find the name of the original artist I would be super appreciative! ), but I modified it to have spots and be even more box-like. 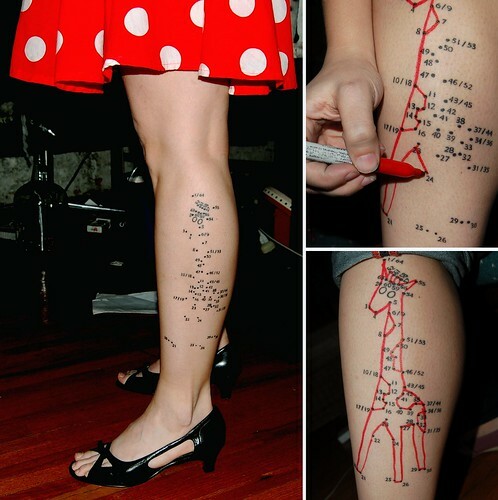 I love this tattoo so much...which makes it hard to walk down the street without starring at my own calf.